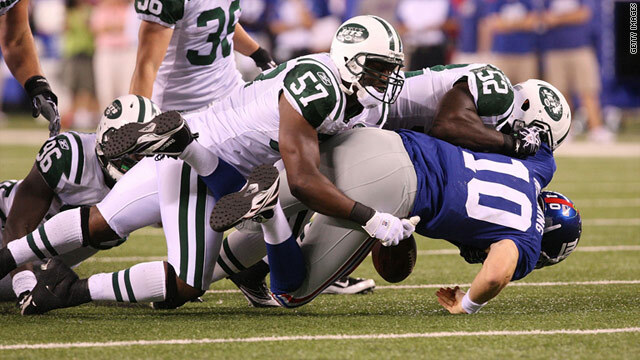 Jets linebacker Bart Scott (No. 57), says fans need to tweet less on their iPads and cheer loudly on Sunday. (CNN) -- New York Jets linebacker Bart Scott isn't just getting ready for the Dallas Cowboys in Sunday's NFL season opener. He's taking on two additional opponents as well: Twitter and the iPad. Scott, one of the Jets' most outspoken players, used a recent interview to call out his team's fans for being too digitally distracted. "We have to challenge the people that [are] in the stadium now to get off their iPads and tweets and represent the stadium and get loud and make it a home-field advantage for us," Scott said Thursday, according to the New York Daily News. Think of this as the football twist on that guy who sits behind home plate during baseball games with his cell phone glued to his ear. Scott suggested that fans may be more apt to tinker with gadgets at the Jets' new, $1.7 billion stadium, where pricier tickets might lead to less rowdy crowds than at old Giants Stadium. The continuing advent of mobile gadgetry has, apparently, caused sports teams to take a second look. Before February's Super Bowl, the NFL apparently pondered whether iPads and other tablet computers would be allowed inside Cowboys Stadium in Dallas. By game time, the league had created its own Super Bowl apps for the iPad and Android devices. "Ah, we can see it now: Fox cuts to the stands after a Green Bay Packers touchdown, only to find a quarter of the fans engrossed in watching the replay on their handheld tablets (Or, more likely, catching up on the latest ads they missed)," Noah Davis of MediaBistro wrote at the time. For what it's worth, Scott seems to be taking his own advice and then some. On his Twitter account, Scott hasn't tweeted in more than three days (somewhat of an anomaly among tweet-crazy pro athletes these days). "Maybe Jets fans can just turn up the volume on their iPads to make some noise."